my kiddos love mozzarella cheese sticks. i love to make homemade ones for them all the time. so, i figured, let me put a recipe of them on my website! so in brainstorming this recipe, i was reaching for some bacon bits to put on my son's sandwich. bacon bits are very popular in my house. it hit me like a ton of bricks to coat the cheese-sticks with the bacon bits. and as much as my kids love bacon, it would be a big deal! so i tried it. all i have to say is, oh em gee. i can not make these enough in my house! it is a nice treat every once in a while when we are feeling naughty. 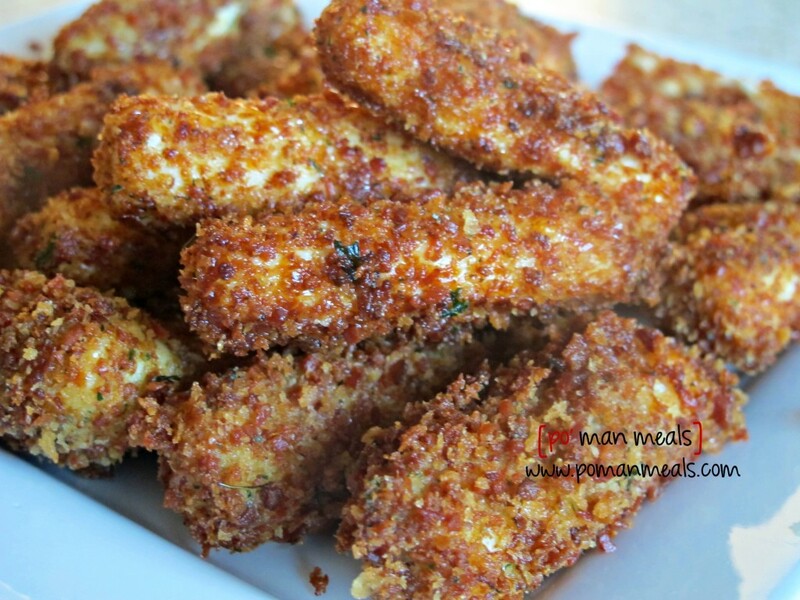 they are perfect for appetizers for a party and even new year's! place the eggs in a medium sized bowl and beat lightly. set aside. in a food processor, add the bacon bits. pulse the bacon bits until fine enough to coat the cheese-sticks. add in the panko, parsley and garlic powder. pulse until combined. pour out into a dish. dip each mozzarella cheese stick into the egg and place into the bacon bit mixture. 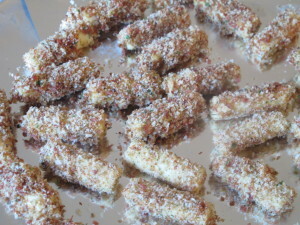 roll the cheese-sticks around in the bacon mixture until coated well. place each coated cheese-stick onto a tray. repeat with the remaining cheese-sticks. put the tray of coated cheese-sticks into the freezer until completely frozen. preheat the oil in a frying pan to 350 degrees. carefully place the cheese-sticks in the oil and fry quickly until golden brown. allow to cool for a few minutes before eating! these can be baked instead of fried! it is also a great make ahead recipe. make a double batch and freeze some of them for the next time you want some. 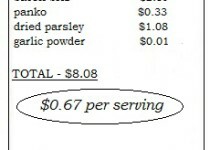 Hi, What is planko? I’ve never heard of it. Thanks for sharing your recipes! How long would they need to go in the oven? hi bernie! i am not sure because i have not tested them in the oven. but i believe a pretty high oven temp for about 10 – 15 minutes. Wow these have my mouth watering, they sound and look amazing! I can’t wait to try them out. What do you upset for dipping? Marinara or ranch?